Tillandsia ponderosa and T. guatemalensis growing in a rain forest around 6,000 to 7,000 feet in Mexico about one hundred miles from the Guatemala border. Photo by Ed Hagthrop, Jr. Cover donated by the Orange County Bromeliad Society, California. This charming Tillandsia is a native of Mexico, where it grows in cloud forests of oak and pine in the states of Morelos and Oaxaca at elevations of 8,000 to 9,000 feet. It is a medium-sized rosette with firm, light green leaves lightly dusted with silver, sometimes reaching 2 feet in length. Leaves are about 1½ inches wide at the base, tapering to a point. The robust spike, 4 to 8 inches long, has a heavy dense panicle over a foot in length. The pendent inflorescence has bracts of a luminous rosy-pink; petals are violet. It was first described by J. G. Beer in 1857, who called it Anoplophytum violaceum. Bromeliad growers are becoming more and more conscious of color in their plants, and it is instructive and interesting to visit collections and see how different certain types of plants look under the various conditions under which they grow. A striking example of this is the collection of one of our members—John Davy. This grower has some rather revolutionary ideas—that is as far as some other growers are concerned—but his collection is just a blaze of color. His plants are grown in a glasshouse with a roof that slopes quite low to the backs of the benches. Plants are arranged in heights, large at the back and smaller towards the front. Without exception, every plant is brilliant. All plants are hosed often and given plenty of water each time and after are usually dripping wet. Tillandsia viridiflora (grandis) in most of our collections has green leaves with the undersides a deep purple. In this collection the whole plant is a bright purple, and the plants are rather squat in shape. Nidularium fulgens takes on the most marvelous color of yellow-green with deeper green spots. These plants, too, are not nearly so tall as those we usually see. I was given one of these beauties and placed it tenderly on the bench in the shadehouse that I believe is the lightest of mine, but in a month the plant was back to the normal green we all have. Imagine Aechmea triangularis with yellow-green leaves and with the black teeth standing out in contrast, Nidularium innocentii var. innocentii with leaves practically all purple, N. regelioides with light green leaves and a lovely soft flush all over, not because it was due to flower either. One could fill many pages describing plants that look so much more colorful than the average, but descriptions are poor substitute for seeing them "in the flesh." Here in New Zealand we have often had arguments as to the best way to grow bromeliads. Some members maintain that if they have few roots they do not need large pots or a rich mix. In this collection all plants are grown in the same mix with the exception of Tillandsias. The mixture used is very porous but is really a rich one and the plants are repotted often. Most are in five-inch pots or larger, and without exception they are absolutely thriving. There is no die-back at leaf tips, and all plants are bursting with health, and those with shiny leaves positively glitter. This member insists that if the plants are given a rich mix and plenty of room they will make roots even if they have not had many before. We all know the old saying that the proof of the pudding is in the eating; well, proof that our plants will respond to a rich mix is in seeing this collection. No foliage feeding is done, but, then, it would be unnecessary. After viewing all these glorious plants and delighting in so much color, I came home and looked at my plants and wondered how I could have thought them colorful at all! However, we must all do the best we can with what we have, but I am quite sure that if I ever had another bromeliad house it would be one with a glass roof and a low roof, but there is little hope of that as when my last house was built I was told, "This is the last!" Cyclic variation of light which may result in differences in the characteristic blooming season. Plants respond to the rate of change of daylight and darkness, as much as to the total energy received from the sun. Variation of light spectrum which may explain the loss of color observed when plants are brought down from the mountains to sea level and when grown in the greenhouse. Water vapor and carbon dioxide absorb portions of ultraviolet and infrared radiations. These are greatly reduced at sea level. Plants grown at altitudes of 5000 feet are subject to about 10 percent more radiation in all parts of the light spectrum. Greenhouse plants are not exposed to either infrared or ultraviolet radiation because even ordinary clear glass is opaque to these components. Rainfall distribution versus season in combination, with the length of day contributes to the rate of plant growth and seed germination. Irrigation may provide sufficient water, but the introduction of dissolved minerals may also produce change or even decline in plant health, vigor, and appearance. Humidity and temperature range which may be the easiest to control. Most bromeliads tolerate high temperatures if the humidity is high but not without air movement. Plants grown in a closed greenhouse or exposed to dank, hot, still nights over a period of time may well suffer. A layer of stagnant supersaturated air surrounding bromeliad leaves smother their normal transpiration, i.e., the functional loss of water through the leaves to the atmosphere. Bromeliads from the higher mountains may well welcome brief sharp drops in temperature at night as experienced in their native habitat. These are significant factors in cultivating bromeliads away from their native Brazil. —The Greater New Orleans Bromeliad Society Newsletter. 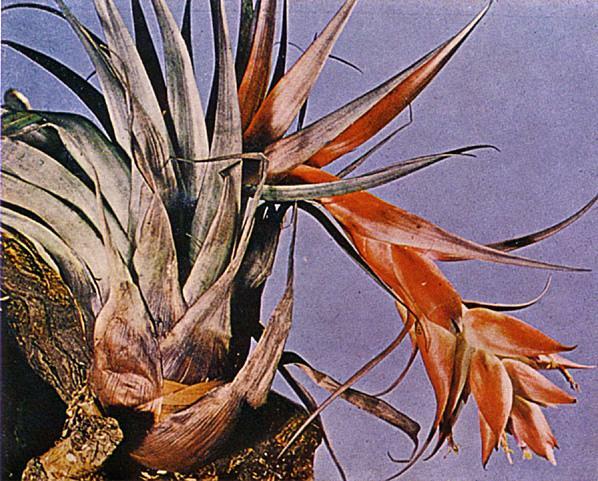 Hybrids have been made for many years between the various species of bromeliads, the first recorded hybrid being made by Prof. E. Morren between Vriesea psittacina and Vriesea carinata in 1870. The plant breeders who have made these hybrids have usually given them names, and many of these names have become known around the world. Because of the rapid increase in the hybridization of bromeliads, a world-wide system of registration has been needed for some time. A uniform code would prevent duplication and confusion in the naming of the hybrids. 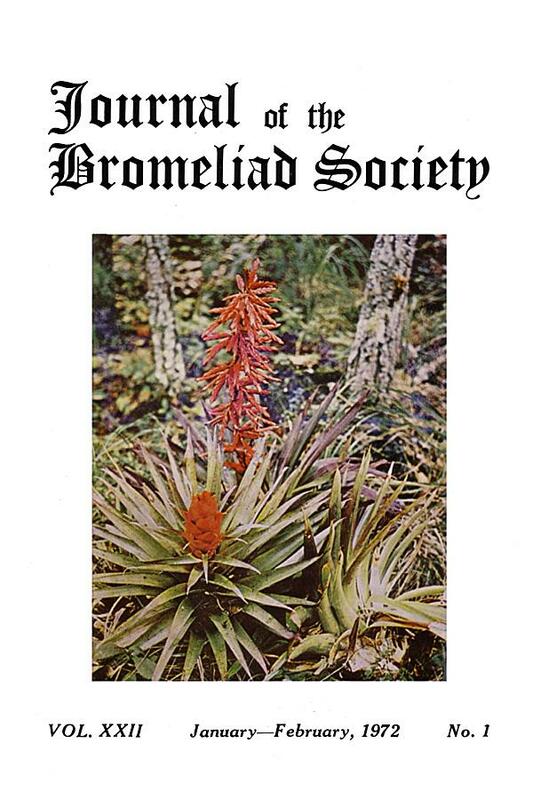 For the past several years the Bromeliad Society has provided this service by accepting applications for the registration of bromeliad hybrids, and lists of approved hybrids have been published in the Journal from time to time. Application forms may be obtained from me, Wilbur G. Wood, 1621 Irving Avenue, Glendale, California 91201. —Self-cross, one parent, must retain the name of the parent but cannot retain the varietal name of the parent. This cross is not a hybrid and cannot be registered. —Cross breed, two clones or individuals (species or hybrids) of the same name, must retain the name of the parent. This cross is not a hybrid and cannot be registered. —Hybrid, two distinct species or crosses involving only one genus, this may be registered. —Bi-generic cross, two species or crosses involving two genera, this may be registered. —Bi-generic and Tri-generic crosses are to be designated by a combination of the generic names. Combination names now in use are to be retained unless there is a conflict. Names for new combinations are to be approved by the registering agency. —Crosses involving four or more genera are to be designated by an arbitrary name selected by the first hybridist to use that combination (in any order). The name selected is to be approved by the registering agency. Note: The term "hybrid" will be used in registration to designate simple genera or multi-genera crosses. —In designating crosses, the seed parent will be listed first, followed by the pollen parent. The listing should include the varietal names, if any, of the parents. However, the same cross between parents with different varietal names cannot be re-registered. —A cross will be considered unique (eligible to be registered) only if the number of times each species involved is used has not previously been registered. The order in which the species are used will not affect the naming of the cross. —A hybrid cannot be registered until one individual from the cross has bloomed. —Application for registry may be submitted by grower of plant but hybridizer must be named and an approval of the hybridizer submitted for the proposed name. The application will list the parents of the cross with varietal names, if any, and a description of the plant and flower. Application blanks will be provided on request. —The name of a hybrid may be anything desired by the applicant (if approved by the hybridizer) which has not previously been registered, except that the name may not be Latinized or preceded by "The," "Mr.," "Mrs.," "Miss," etc., but may be preceded by a title of distinction, such as "Pres.," "King," "Gov.," etc. —After registration has been made of a cross, the name cannot be changed, however, corrections of errors, such as spelling, may be made. —The registration of a cross will be canceled if it is later found to be ineligible under the rules prevailing at the time of registry. —Hybrids made and named prior to the date set for accepting applications for registry will be registered as they are, even though they would not then be eligible. When a cross has more than one name, all names will be recorded and such names will be valid as synonyms. If either or both parents are not known, but the hybrid is established it will be registered giving such information as is known. All new hybrids must list both parents. calyculata × miniata (discolor) = ? calyculata × recurvata = ? miniata (var. discolor) × calyculata = ? miniata × weilbachii = ? recurvata × calyculata = ? weilbachii × distichantha = ? Members are invited to send in questions — they will be answered by experts! Q. What caused my nice Neoregelia farinosa hybrid to change from a lovely rose to a dark maroon? A. Neoregelia hybrids may pass through several color changes as they reach maturity, or any individual plant may change in color from a change of light. Neoregelias are in their peak of color at flowering time. This color flush lasts from 3 to 6 months, in some species nearly one year. Q. What causes bromeliads to bloom prematurely? How can one avoid this? I have had a great deal of this trouble lately, especially with Aechmeas, and the blooms are about one half the size they would be normally. A. A very difficult question to answer. A long dry spell—a complete change of light exposure—a leakage of gas from a gas heater—any of these conditions might cause a premature flowering. If the blooms are half size, then the shock has most likely been gas or some chemical change introduced. Q. What is the best method of applying liquid fertilizer? Do you advocate spraying or should the potting medium be saturated? A. Liquid fertilizer may be applied through your watering hose or sprinkler. It is better to feed oftener with a greater dilution than directions on spray material suggest. It can be sprayed on both the plant and the potting medium. Q. How do you keep very young seedlings in the ground? Mine will not stay in the soil mixture. A. Have never known of this trouble except when roaches or other insects uproot the small seedlings and eat the roots, or if the seedlings are too close and too dry. Watering should be watched very closely. Too dry or too wet could cause drying off or rotting off of seedling roots. Q. How do you handle Vriesea carinata offshoots that come between leaves and do not have roots? A. When offshoots appear on V. carinata they are generally inside the basal leaves. Do not remove them until the offshoot has four or five leaves and is about four inches high. It can easily be removed by firmly pressing the offshoot down from where it is joined and then with a slight motion from side to side and then tear it off gently, always keeping a firm hold on the base. It may also be severed with a knife, but much care should be used not to sever the base where the new roots are to be formed. Shoots can be potted directly in orchid fiber although it is safest to allow them to dry for two or three days before potting. Fermate is one of the safest fungicides for bromeliads. The ends of newly separated offshoots can be put directly into the power without injury or the fungicide can be used in the water that you sprinkle on your small seedlings. "Terrestrial growing — likes to be moist in leaf mold media. This is an outstanding find. Handsome growing plant with light purple undersides of leaves producing a split inflorescence of bright orange." From that year, I have been growing two of these collected plants. During July of this year (1970) an inflorescence formed in one of the plants and the result has been very intriguing to me and one which I believe will be of interest to our readers. But first, a general description of the plant will not be amiss. When full grown the rosette of leaves has a spread of some two feet and a similar height. The widely spaced leaves number about twenty and have long narrowish channeled sheaths, pale mauve in color, which as they widen into the leaf blades change color to a dull light sage green, concolorous and glabrous. The leaves are 2 inches wide and thick in texture and grown at a rigid angle away from the stem. At about 4 to 6 inches from the leaf point, the leaf bends outwards and then terminates in a recurved soft cusp. The inflorescence is a simple, somewhat slender sword-like spike of flat brilliant red suffused with yellow-green bracts. The young spike is quite colorless deep down in its nest of leaves, but as it emerges clear of the leaves it takes on a red color. At the first flowering the inflorescence of closely packed bracts is short, about 3 inches long and ¼ inch wide and 3/8 inch thick. The color is predominantly a strong crimson-vermillion which overlies yellowish-green which appears at the base of each bract. Close scrutiny reveals vertically and closely together parallel red lines running from the solid red color to become distributed over the yellow-green base color of each bract. Each bract enlarges separately and then hinges out from its axis with the stem to form a boat in which a single yellow flower lies and peeps, for, except for its tip, it is completely concealed by the bract. A flower lasts for one day in view, the next day being taken up with the bract gradually closing and the next bract on the opposite side of the stem enlarging and beginning to open. The bracts open alternately, first one side, then after flowering and returning to its original position close to the stem, the next bract on the other side begins to open and to show its flower nestling in the boat so formed. The flowers do not alter in the amount of their emergence as flowering occurs up the stem. The unflowered part of the spike is pushed first to one side, then to the other, as each flowering occurs, reminding me in slow motion of the neck movements of those gracious dancing girls of India and Thailand. The scape is all the time elongating as the flower bracts grow and tends to become crescent shaped, as it lengthens and narrows to a rounded apex of a single embryo bract. In addition to all this lengthening by the enlarging flowering bracts, further embryo bracts continue to grow at the upper end of the spike. 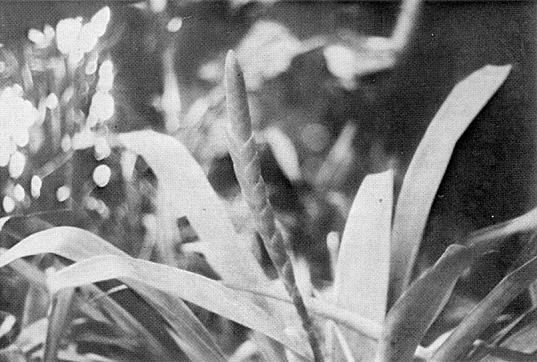 A count of the flowered bracts along one side of the spike during its growth resulted in 11 and 5 respectively. Fourteen days later a similar count showed 15 and 7 respectively and the length had increased by 4 inches. A total of 22 bracts along one side was ultimately reached on the 1st of December, when there were 17 flowered and 5 unflowered bracts with a total length of 12 inches. Thus the plants was in spike from July until December, a period of 5 months. And this in the adverse conditions of an English climate! During the winter in England, the days are very short, the weak sun (when it shows itself) rising at 8:00 a.m. and setting at 5:00 p.m., and the majority of the days are dull and dark. Growth virtually ceased, so that bract opening and spike growth slowed down very considerably. It is now May and I am able to tell a little more about this Guzmania following the absence of growth of the flowering spike. During the winter the inflorescence very slowly lost color and the bracts became dry, tough, and straw colored. As the spike died and dried, the scape which is 1/8 inches in diameter has elongated so that each bract has become separated from its neighbor along the stem and now the spike has curved into a sickle shape. The base of the plant shows an inclination to be caulescent. At present there are no signs of any offsets appearing. Has this plant been named? For those who are just starting their bromeliad collections and wish to be certain that they will have flowers for the holidays, the following is a list of those bromeliads in bloom in my southern California garden on New Year's Day. It is interesting to note that it made no difference whether the plants were grown in the greenhouse or in the open garden—the same species were in bloom whether inside or out, and the quality of the inflorescence was the same. Greenhouse low was 60 degrees; outdoors, 37 degrees for a short period on several nights. All the Aechmeas and Billbergias were grown outside. They include A. dactylina, A. dealbata, A. fasciata, A. calyculata × miniata, A. × 'Foster's Favorite,' A. nudicaulis, A. coelestis var. albo-marginata, A. mertensii, and A. pineliana. Billbergia × 'Theodore Mead' blooms at least 4 times a year and hangs from a tree. B. × 'Fantasia' has formed a large clump in the ground, and B. leitzii in a crowded pot with many bright blooms makes an attractive Christmas decoration. Guzmania lingulata var. cardinalis and G. lingulata var. magnifica make handsome holiday plants. They need greenhouse protection. Vrieseas grow well both indoors and out. V. carinata, V. × 'Mariae', V. ensiformis, V. × 'Polonia,' V. × 'Gloriosa,' and V. retroflexa last in color for many months. V. phillipocoburgii grows as a terrestrial. Tillandsia cacticola, T. cyanea, T. lindenii, T. stricta—all add holiday color. They are grown both indoors and out. The Neoregelias and Nidulariums growing under lath and along a shaded border are still in good color long after their original blooming period. Man's knowledge of nature has come, to a great extent, through careful experimentation and observation. Modern technology has, and continues to produce, sophisticated tools which permit the scientist to approach problems with ever greater analytical competence. Still, the layman with little formal training and almost no equipment can continue to make substantial research contributions in many areas of biology. All research, regardless of its complexity, must follow certain rules of procedure, however. If these widely accepted rules are neglected, even the most simple and clear-cut experiment may yield invalid or misleading data. In the following paragraphs I will attempt to outline the general rules and procedures which should be considered in all scientific investigations, including yours on bromeliads. Dr. McWilliams, in a second part of this series, will point out a few of the many aspects of bromeliad biology which, if properly researched, could provide much enjoyment for you and valuable information for others interested in the Bromeliaceae. Plants, like all organisms, are extremely complex and often respond to a specific environment or treatment in more than one way. Individuals of the same species, like people are not identical. Even members of a group of seedlings originating from the fruit of a single self-pollinated parent, maintained on the same greenhouse bench and given the same care will not always grow at equal rates, nor will they flower on precisely the same date. Some of this variability may be related to genetic differences among the progeny of a single parent. Variations may also result from subtle differences in the environment which cannot always be perceived or controlled by the investigator. For example, dissimilarities in pot drainage can produce great variations among plants which outwardly appear to be growing under uniform conditions. Because variability is built into any group of organisms no matter how homogeneous their genetical and environmental background, experiments must be performed on a large enough group to discount the occasional strongly aberrant individual and to take into account all lesser variations. Valid experimental results are based on average responses and not on the behavior of any one individual, no matter how typical it may seem to be. Generally, the more variable the response, the larger the group must be. Individuals within the group should always be as homogeneous as possible. Specifically, plants should be approximately the same size and age, equally vigorous, and should have received similar care for several months before the study is initiated. If the response is absolute (for example, success or failure in flower production), the group may be fairly small. It should, however, be of a size such that each sub-group receiving a different treatment contains no less than 5 members. Thus, a group of plants which is to be monitored for flower production following treatment with 3 different concentrations of nutrient solution would require 20 members—a control group of 5 members (see below for a discussion of "control") and 3 sub-groups, each also containing 5 members. When the response to be assessed is more subtle (the intensity of leaf color under different light regimes, perhaps), the sample must be much larger. Good criteria for evaluation must also be established. A scientist would, in the latter example, extract and measure the pigment and express the response to light in units of pigment per leaf surface area or leaf weight. You would have to use a more poorly defined color code, but this is possible within limits. Finally, any experiment should be repeated at least once. If the number of plants employed in an experiment is sufficiently large and the resulting variation in response to a treatment is small enough, the average response of these individuals will be a reliable estimate of how all similar plants under like conditions would respond. Since you can't, and wouldn't want to, test all plants of a particular type, you attempt to select groups which accurately represent the entire population. If the groups are homogeneous and treated equally in all ways short of the one variable being tested, these groups may be compared. If they respond in unlike ways to two or more treatments such that the average reactions of the groups are distinctly different, the treatments have produced "significantly" different responses. Significance, in this sense, is usually determined by statistical analysis and these analyses are varied and should be selected according to the needs of a particular experimental design. Although many statistical tests are not difficult to apply, few people have access to the necessary texts and tables of probability. Suffice it to say that statistical significance can usually be evaluated in experiments designed to assess obvious responses without the aid of formal mathematical analysis. In cases dealing with numerical data such as the number of flowers or fruit produced per plant or the number of offshoots generated by a postflowering rosette under various conditions, significance can be evaluated by simply comparing the numerical yield per plant for each treatment. If the sub-group size is 5 or more and the average number of off-shoots or fruits is substantially higher in one sub-group than in another treated differently, then the two sub-groups reacted in significantly different ways. In well-executed experiments all tested individuals must be treated in exactly the same manner except for the one variable which is being evaluated. Because plants are so complex, two or more variables often interact in unpredictable ways. Therefore only one variable is usually tested in each experiment; then any observed differences which result between two sub-groups are probably due to the treatments and not to some other inconsistency of culture. To make certain that this is indeed the case, a separate sub-group of plants just like those receiving the treatments should be included in every experiment. This sub-group of plants, known as the control, is treated like all others except that it does not receive the special treatment; it will then be compared with the other sub-groups to make sure that the general treatment received by all experimental subjects did not produce effects that could otherwise be attributed to the special treatment under investigation. All well-designed experiments have control whenever possible. Three aspects of scientific research which often receive insufficient thought and planning are the determination of purpose, the development of appropriate experimental design and the maintenance of adequate records. Complete records are obligatory; don't feel that you will remember anything. One forgotten fact can be enough to ruin much effort and waste considerable time. A thoughtful analysis of what the particular experiment can and should prove will precede your investigation. Scientists frequently speak of making a "hypothesis"—this is a supposition which will be tested by an appropriate experiment. The design of the experiment is all important if economy, reliability and significance are to be maximized. The topic of experimental design is a complex one and is best described by illustration. What is the optimum concentration of "Omaflora" needed to induce Aechmea fasciata to flower? Hypothesis: an optimum concentration exists; levels above or below this optimum will be less inductive or even injurious. 1. Forty Aechmea fasciata seedlings or cuttings are selected for uniform size, that size being within flowering range. All plants have been maintained under identical conditions for at least several months before experimentation. All plants are potted in the same material. 2. Concentrations of "Omaflora" are to range from well below to above those recommended by others or by the manufacturer. These solutions are carefully made before use. 3. Space is provided for 40 plants so that they can be maintained under identical growing conditions. Divide the 40 plants into 2 groups, one group being "experiment 1", the other, "experiment 2". Subdivide each group into 4 sub-groups of 5 members each. Label each pot, viz., "exp. 1, sub. 1" etc. Place the pots at random in a square on a single greenhouse bench or other suitable exposure. Record the position of each plant in the square. Add "Omaflora" solutions of 3 different concentrations to 3 sub-groups of each main experiment group, recording which plant number receives a particular concentration. To the remaining 2 sub-groups—the controls—add water only. Fill the tanks in all cases and keep them filled by adding water over a period of 2 months; i.e., after the initial "Omaflora" treatment, all 40 plants are treated in exactly the same manner. Observe the plants each day and record any unusual events or nonuniform developments which occur. On day 60 record the plants which have flowered and the size of the flower cluster as well as the number of flowers produced. Note any damage to the inner leaves or any differences in vigor among the members of the groups. These experiments show that the highest concentration of "Omaflora" is significantly better as a floral inducer than the two lower concentrations. The fact that the controls failed to flower further suggests that flowering was not spontaneous but was induced by the chemical. These results should not be assumed to apply to other species or to similar plants of a different size or age. If the effects of different "Omaflora" concentrations on the size and color of the inflorescence are to be evaluated, much larger groups would be necessary since these are highly variable characteristics which are more difficult to quantify. The results in this situation are inconclusive. If anything, these data suggest that none of the concentrations of "Omaflora" are effective in floral induction of Aechmea fasciata plants of this age under these conditions. You have now completed your experiment with the help of your most valuable research aids, common sense and a knowledge of plant culture. Your experimental results should be made available to others. Your report should always include a statement of purpose and a brief review of the literature which deals with the phenomenon you are studying. This is followed by a description of the experimental design employed and the nature of the plants and the treatment materials used. Next, the results should be presented in a manner which is understandable to persons less familiar with the problem than you are. Finally, conclusions should be drawn. They should be related to your purposes and must be consistent with your data. Data expressed as numerical averages, graphs or other appropriate presentations must always be provided. Good research reports are brief and concise. In constructing the bromeliad tree here in the Brooklyn Botanic Garden, as reported in the Bromeliad Society Bulletin, July-August, 1967, osmunda fiber was used exclusively as the medium for planting the bromeliads. Plants grew beautifully for some time, but osmunda fiber disintegrates eventually into small broken particles. In time some plants began to lose their anchorage, causing them to deteriorate. Despite good humidity in the air and occasional feeding, some plants were dying from drying out for lack of sufficient and proper medium. On the other hand, some plants had so thoroughly attached themselves so well to the cork and their niche, they did very well. It became apparent that such a set-up with osmunda fiber only is limited to a life of about three years, and plains were made to reorganize the "tree." This permitted changing its shape—improving the model, as it were. Everything was taken off the tree, leaving only the framework of pipes, and then first some of the pattern of pipes was changed. A new mixture was decided upon consisting of about equal parts of peat moss, fir bark chips, and osmunda fiber. Thoroughly mixed in with this was the fertilizer known as osmocote. This breaks down steadily for about six months. This medium proved to be an excellent one—the results were soon apparent with quick good growth, and plants continued to show quality caliber. To do the overhauling job required a small crew until it was finished. I was in Brazil when the work was done. The plants had been piled into heaps awaiting the planting and labels were lost and misplaced to wrong plants. Of the workers involved, none knew bromeliads, and so after I came back I have had the job of checking and determining some of the identities as they flower. 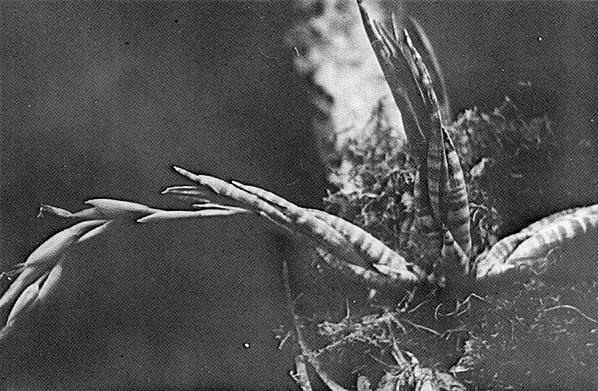 In checking our Billbergia lietzii I referred to the original material in La Belgique Horticole (1881). 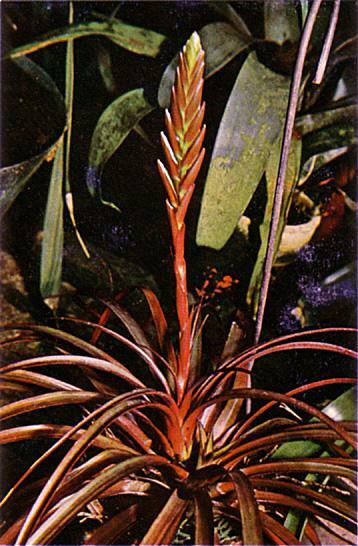 It was named and described in that issue by the outstanding bromeliad botanist, Edouard Morren. There are two plates in color, one of which depicts two "double-flowered" blossoms of B. lietzii. The abnormalities of the two kinds differ but neither approaches the double-flowering of those kinds in which the extra "petals" are modified stamens, such as the double-flowering Japanese cherries and peonies. Morren remarks (in French) that this is the first time, to his knowledge, a bromeliad flower has shown a tendency toward double-flowering. For several months, the editor for our local chapter, Judy Drake, spent one or two afternoons a week as a volunteer to help me with our bromeliad collection. She proved a capable assistant, and the collection achieved superb condition during her "tenure." She was thoroughly at home, whether climbing up ladders and transplanting on the tree, or with other chores. The last day before she left for her new home in Michigan, I asked her if she could treat some of our plants with Brombloei to stimulate blooming. Among them were plants whose identity I wish to determine. As a result of her work, four different kinds bloomed six weeks after treatment, all with fine full inflorescences. One of the plants that bloomed came as a seedling under the name of B. kuhlmannii. Instead of a species it turned out to be a hybrid, the most beautiful Billbergia inflorescence I have ever seen. The watch-spring petals were very long, of a rich glowing royal purple and the stalk and sculptured ovaries were rather thickly scaled white. It is evidently a cross between B. zebrina and B. brasiliensis. In the seventh week a plant that was purchased as Billbergia magnifica bloomed. It was high on the tree and as the imposing red-enclosed inflorescence appeared, it gave hope that here was something magnificent. Well, surprise! its flowers showed that it was not that species, but B. brasiliensis. At eight weeks a plant that had the label Aechmea organensis started to come into flowering. The open inflorescence appeared away down in the cup, and unless it were to develop an additional foot or more in height, it would be obscured by its own leaves. It was a fairly large inflorescence, branched at the base. It took its darn good time in pushing up with all the unbranched top part blooming before any of the branched parts. After these first ones finished blooming, then the rest of the inflorescence rose up boldly and bloomed in its own time. Again, the knowledge of a misnamed plant, and the problem, what is it? 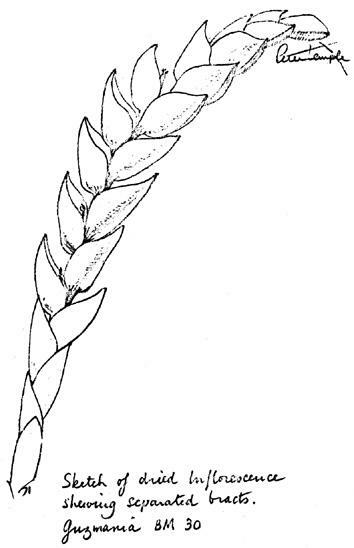 In running down the key for Aechmeas in The Bromeliaceae of Brazil by Dr. Lyman B. Smith, the answer was found—Aechmea candida. This plant was first identified only from cultivated material. It was apparently growing in Brazil and sent to Europe where it became established in collections. 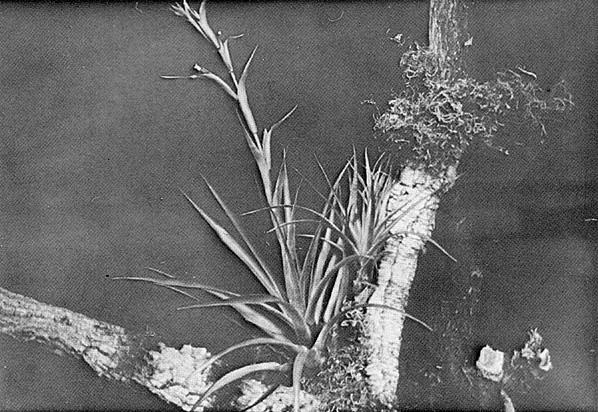 It was later found growing in the state of Rio de Janeiro—see Bromeliad Society Bulletin, XIX, 101. The floral framework is white and woolly. Unopened buds show long black sepal mucros, ovary white, calyx yellow with the white petals folded awaiting opening. When open, the white petals are so distinctive as to merit the Latin name, candida, meaning a shining or pure white. After flowering the ovary is white, the calyx green, and the petals which persist dried are, like some other Aechmeas, black. The whole inflorescence is about a foot and a half high, with uninteresting lanceolate bracts, but the long branch bracts and the little bracts beneath each flower are a reddish copper and colorful in contrast with the rest of the inflorescence. 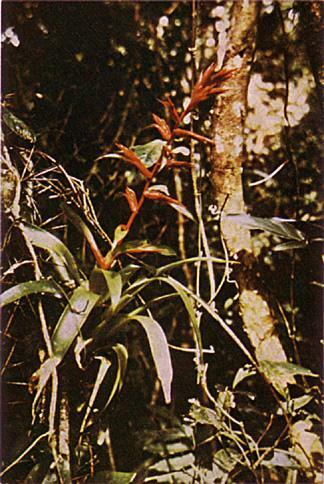 In a few cases, emerging inflorescences appeared with the large enfolding red stem bracts that are to be found in both Billbergias and Aechmeas. Several days can pass before opening enough to find out whether your plant is one or the other without prying into flower parts. Suspense can usually be eliminated and the genus determined by looking at the edges of the large bracts. Aechmeas often have teeth on the bract edges, but Billbergias do not. The teeth may be fine or few, so sometimes a little magnification will help. So here is a trick for you, and encouragement to sharpen your sense of observation. One of our local chapter members, Walter Warnick, visited Kew Gardens, outside of London, this summer and told me that they have developed a fine bromeliad exhibit with many plants, attractively arranged and with the plants named. However, he noted, some of the botanical names are different from ours. When I was working on the Color Dictionary of Flowers and Plants, which originated in England, Aechmea fasciata was handled as A. rhodocyanea. I asked that it be changed to A. fasciata, to which it was agreed after looking into the matter. A. rhodocyanea is a nurseryman's name that is sometimes used by them in England. In the printing of the concluding installment of my trip to Brazil, Sept.-Oct., 1971, two matters need comment. On page 103 the first sentence should read ". . . . chamissonis, related to the orchid that produces the vanilla bean..."
On page 106, the last sentence of the second paragraph should be the last sentence of the previous paragraph, to be added to that paragraph. It is from Aechmea ornata 'Nationalis' that Padre Reitz gave away cuttings, and which command a fantastic price, probably because of its scarcity, as well as its outstanding nature. Padre Reitz has been appointed the new Director of the Rio de Janeiro Botanic Garden. Let us wish him all good luck in developing its possibilities. Several uses of various Puyas growing in Chile have come to our attention. After the inflorescence of Puya raimondii has withered, it is cut down, divided into sections, and used for making drums, the ends being covered with animal skins. The pith of the stems of P. chilensis has been used for corks, the flowers are used as a remedy for hernia, and the spines of the leaves are utilized by the natives for fish hooks. As the stems of both P. chilensis and P. berteroniana are very light, they are used as rafts and also as floats for fishing nets. The plants may vary in height from one-half inch to 12 and 14 feet; some are small rosettes, some are large urn-shaped plants, or they may be rather bulbous in form. The compact and rosette forms are generally small and often have twisted leaves. The flat leaf types which are generally smooth, if shade loving or growing in moist, high locations, are usually the larger plants. The leaves are always entire (smooth edged), and are either glabrous (smooth) or lepidote (fuzzy). Most of the dry climate or tree-top species are covered with tomentose scales, whereas those in a. moister climate have a smoother and broader leaf. Many species of Tillandsias and Vrieseas may appear to look so much alike that they could easily be confused. The one salient feature which is most evident and easily determined is the absence of nectar scales at the base of the petals of Tillandsias and the presence of such scales on the Vrieseas. The xerophytic Tillandsias may be confused with Vrieseas if the petals are not examined. If you find the name of Spanish Moss — Tillandsia usneoides — difficult to remember and pronounce, try to memorize some of the first names given to this bromeliad: Camanbaya brasiliensibus, Viscum caryophylloides, Cuscuata ramis arboreum innascens are just 3 of 23 titles bestowed on this unusual plant. This rare Tillandsia is from the collection of Alfred Blass of Munich, Germany, who is one of the few growers on the Continent able to cultivate this plant successfully. It is an attractive, medium-sized species from Mexico. Its green leaves, about a foot in length, have brown to dark violet sheaths. These form an open rosette from which arises the tall inflorescence with its coral-red bracts and violet petals crowned with golden stamens. This bromeliad, first described in Ceiba in 1953, is rarely seen in cultivation. Tillandsia lieboldiana Schlecht. in native habit. This species is commonly found in forests from southern Mexico to Costa Rica growing from 100 to 8,000 feet. It is often seen in collections, for it is one of the few soft-leaved Tillandsias that seem to thrive in cultivation. It is a small plant, from 6 to 10 inches in diameter with paper-thin green leaves forming a crateriform rosette. The foliage is sometimes dark at the base and speckled with maroon. In bright light, leaves often become blotched with red. The spike may reach 2 feet in height bearing scarlet bracts and violet petals. Var. guttata is endemic to certain areas near Cartago, Costa Rica. Sheaths are light green, leaf tips are dark red, gradually becoming red spots and fading into pale green below. Banded Tillandsias are few and far between, and such species that have banding on their leaves are true collector's items. Such a plant is T. subulifera, an attractive but rare species that has been found growing in Panama, Trinidad, and Ecuador at elevations ranging from 150 to 600 feet. It is a small plant, its few grayish-green leaves, the longest measuring 8 inches, forming a distinct, cylindric pseudobulb. The foliage is marked with distinct white crossbands. The erect scape is concealed by the leaves, exposing only the simple inflorescence with its broad floral bracts. The flowers, from 4 to 6, have white or yellow petals. It is similar to the better known T. paraensis. This is a charming little species, attractive whether in flower or not. It is to be found in the dense wet forests of Central America, Trinidad, and northern South America from 75 to 3,500 feet. T. monadelpha is a small rosette with shiny, narrow, recurving leaves that are usually green above and red beneath, although at blooming time the entire plant may become a deep maroon. Leaves are about a foot long, ¼ inch wide and tapering to a point. The erect slender scape, about a foot high, is reddish, the flattened sword-shaped inflorescence has green and red bracts and flowers with white or yellow petals which are highly fragrant, especially at night.